The Lady Blakeney is starting a new roleplay! More info will be up soon! The only character taken FOR SURE is (Of course) Marguerite. Yes! Finally! The new page is done! It will be up in a few days so check back! I know a couple of the links and images may not be owrking right now... but that's okay! Check back in a few days, we're just waiting for info from our 'testers'! 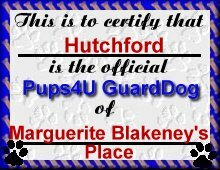 Meet Hutch, Lady Blakeney's new guard dog. You may think she would want one a little more elegant, but Hutch is very sweet! (She didn't even realise the red flowers on the mat he was on until she stuck him here~! I am having HTML problems... please excuse this messy page!